Gastrobar Emo is easy to step in to enjoy easygoing service and good food. Emo (Dam in english) was opened on the 21st of August 2013 in the same place where Michelin star restaurant Olo used to be. Owners are partly the same which should be a proof of excellent food experience. 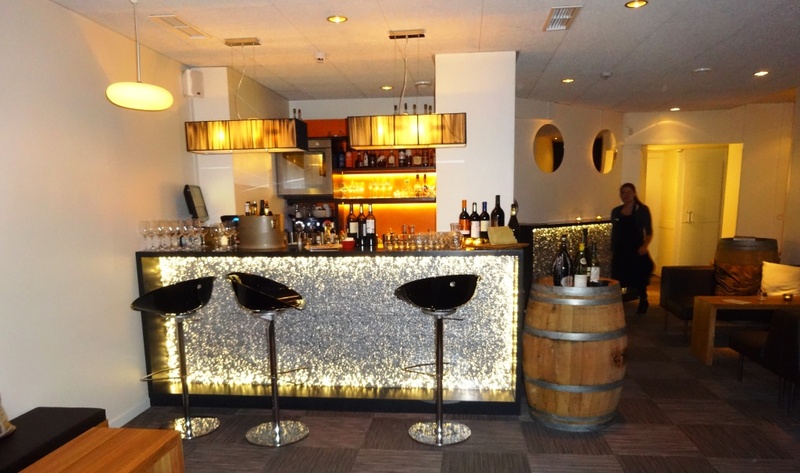 There is also separate wine bar which provides opportunity to enjoy an aperitif or glass of wine. 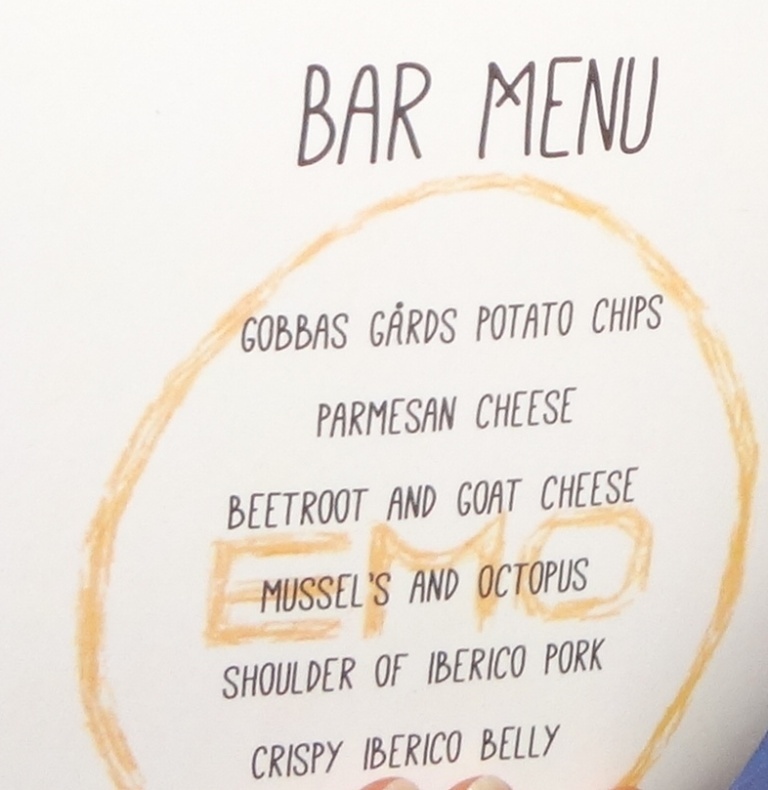 With drinks you can order snacks from bar menu. We visited wine bar after dinner, there is narrow corridor between dining room and bar but it also has separate entrance. 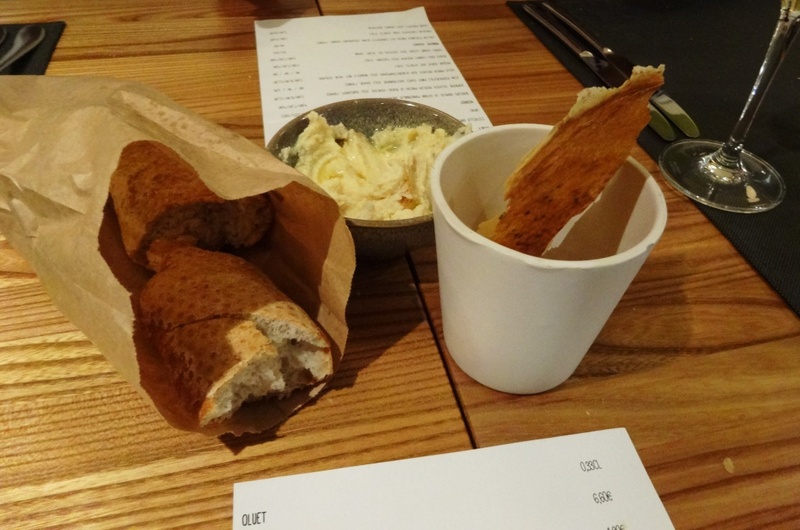 Quite soon after you arrive you will get some snacks and fresh bread with celery butter which was really tasty. Brown paper bag is one way to serve bread but it would have been easier to take bread from bread basket. You can choose your dinner from 3 “starters”, 4 “main courses” and 3 “desserts” up to assemblage of 6 foods. 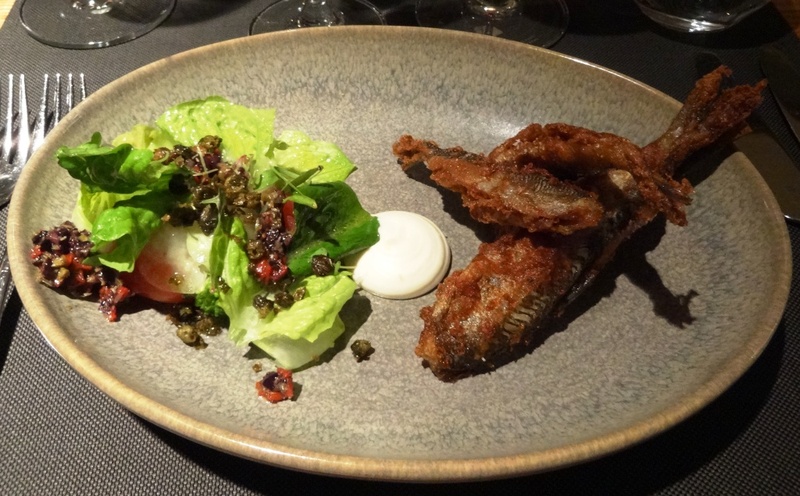 Our group decided to go for 3 courses and ordered first 2x FINNISH VENDACE’s and 2x WILD DUCK WITH RED CABBAGE AND APPLE. 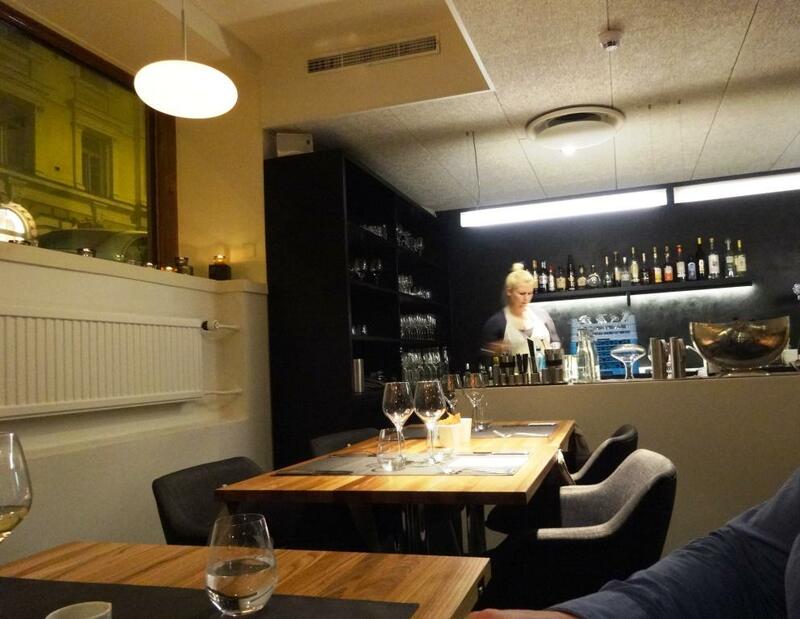 Name Finnish vendaces might be misleading; we got Finnish fish but the way it was prepared was actually better than traditionally fried vendaces. Frying in oil instead of frying in a pan with butter made vendaces more crispy but not so greasy. On top of that side dishes were a perfect match. 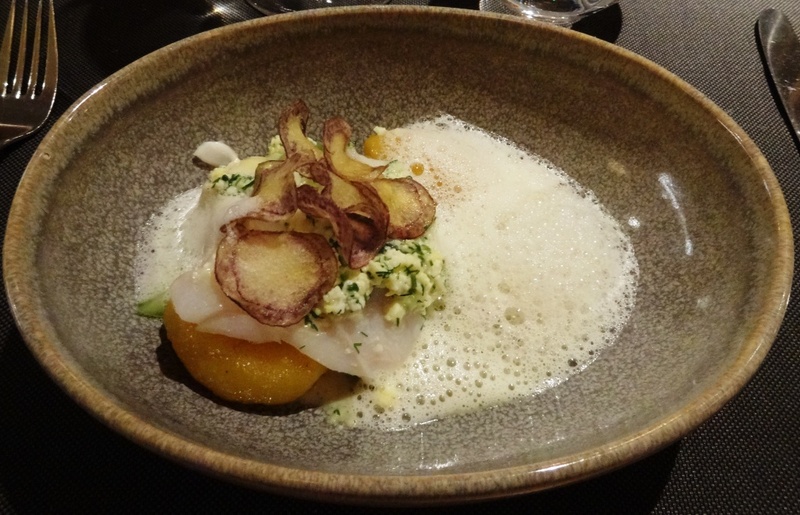 Next courses were 3x GREENLAND HALIBUT WITH POTATOES “GOBBAS GÅRD” and 1x WILD DUCK WITH RED CABBAGE AND APPLE. Halibut was bull’s eye. Cooked to a turn and two different ways to serve potato complemented fish nicely. If you take wild duck for starter it is served on stone plate, which is clever idea to convert “main course” to “starte”r. 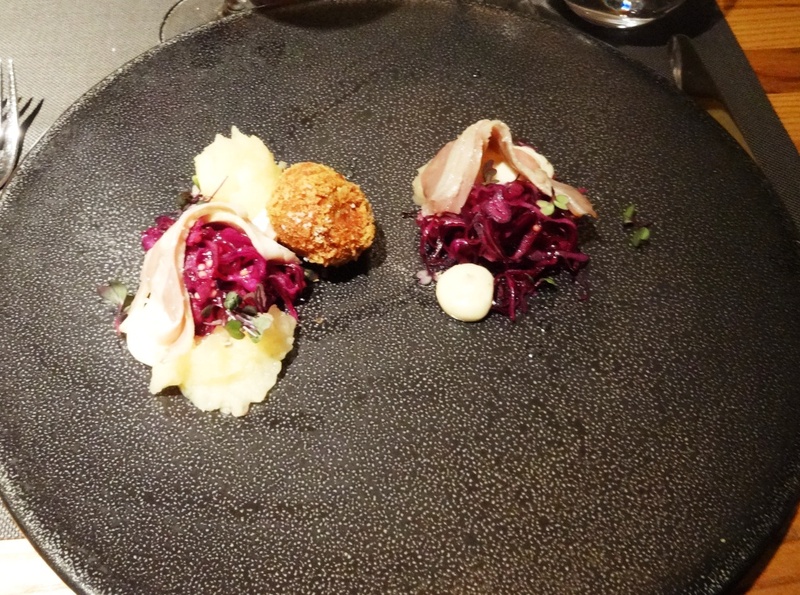 There was three different ways to serve duck and again duck paired perfectly with cabbage and apple. There were 3 different cheeses on the plate: blue cheese, cow and goat cheese. Apple and onion conserves supplemented taste of cheeses nicely. One kind request; please make portions a little bit bigger 🙂 Or maybe intention is to eat at least 5 portions which hopefully are not too small. Otherwise Emo manages food part fine and earns a place as laid-back little brother of Olo. We asked recommendation for dry riesling and waitress suggested MAX FERDINAND RICHTER MülHEIMER SONNENLAY RIESLING ZEPPELIN 2012 MOSEL from Germany which we ordered. After tasting, as wine seemed not to be dry, asked for the amount of sugar. 35g for “dry” is quite a lot, but wine itself was basically OK. A positive thing is the pricing of wines; most of them were less expensive than they usually are in a fine dining restaurants like Emo is. Waitering was thoughtful and professional but we could have managed without overflowing twitter. Reserved table next to the fireplace because window tables begins to be cool at this time of year. This time fireplace was reserved for candles. For starters ordered Roast reindeer, terrine of cauliflower and chanterelle, cranberry and onion compote and Venison soup. Reindeer was tender and tasty as it should be almost carpaccio but lightly roasted. Compote added needed sweetness for portion. Soup which included tiny vegetables was a little bit letdown but luckily rolls corrected first impression a lot. Venison could have tasted more. For main courses had Duck stew in red wine sauce Lappish potato duchesse and Pan fried Arctic char, roe hollandaise, Lappish potatoes. Stew was delicious, on top of duchesse were a little bit bitter cowberries which supplemented almost sweet sauce well. Arctic char is quite nature fish with game as usually restaurant serves salmon. Both portions included Lappish potatoes which are floury puikula potatoes (no exact translation). Roe hollandaise sauce was tasty and complemented fish perfectly. For dessert enjoyed Warm apple, vanilla sauce and Crepe with old time vanilla ice cream and jam. Apple dessert was bull’s eye, really sweet and enjoyable. Crepe, the best in the city, was again delicious. Blue Peter focuses always on athmosphere and service which are important part of total experience. Wine recommendations were well designed and were important part of dinner. Especially can recommend red wine Nugan Estate from Durif grapes. Durif was unknown grape for me before but had to buy one bottle to home in order to ensure it was so good as it was with starters.